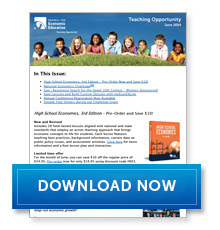 Includes 28 field-tested lessons aligned with national and state standards that employ an active-learning approach that brings economic concepts to life for students. Each lesson features teaching best practices, background information, current data on public policy issues, and assessment activities. Click here for more information and a free lesson plan and interactive. For the month of June, you can save $10 off the regular price of $34.95. Pre-order now for only $24.95 using discount code HSE3. Books will be shipped upon publication in early July. Quantitative easing places what type of pressure on the international value of the dollar? Of the components of GDP, which is the most important for long-run economic growth? 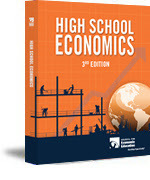 The 14th Annual National Economics Challenge top-prize winners were students from Bellaire High School in Houston, Texas for the Adam Smith Division, (for advanced placement, international baccalaureate and honors students) and Hunter College High School in New York City for the David Ricardo Division (for students who have only taken a single-semester economics course). Meet the winners and watch the finals on-demand, at www.facebook.com/councilforeconed and click on the Ustream tab. 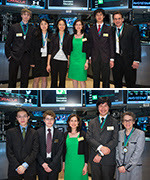 And take a look at some of the photos of students, coaches and CEE staff captured at this very exciting event including winners ringing the bell at the New York Stock Exchange. Sign up for news and announcements about the 2015 National Economics ChallengeSM. The winning entry of the CEE Choice Contest was created by a team of five students of M.T. Blount High School in Eight Mile, AL whose mission topic is the importance of insurance. Gen i Revolution’s upcoming sixteenth mission will draw inspiration from this entry. The new mission will teach the important financial literacy concept of protecting and insuring. The Popular Vote Contest was won by a five-student team from Peak to Peak Charter School in Lafayette, CO. The team’s video, Using Credit, demonstrated their Mission topic of properly using forms of credit. Thank you to all the students and teachers who participated. Gen i Revolution is being played by over 200,000 students across the county. 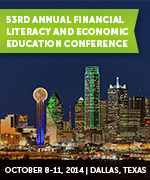 Don’t miss the 53rd Annual Financial Literacy and Economic Education Conference, Oct 8–11, 2014 in Dallas, TX. Register today. Donate today to CEE’s Challenge Grant and help us reach more teachers and students! As educators, you’ve made a commitment to teaching your students the fourth “R”–a real-world understanding of economics and personal finance. You’ve experienced firsthand the programs offered by the Council for Economic Education–professional workshops, curriculum development, materials and national competitions-and you know their value. We hope you’ll consider making a donation to CEE so we can continue to support the important work you do. Every gift counts–no contribution is too small! If you contribute by June 30, your gift will be matched through a $175,000 Challenge Grant from two of our generous Board Members. Those are economics we can all understand!